I don't think I had ever been to or seen a flea market/swap meet until Charlie and I started going to one in Raleigh, North Carolina back in the late 80's when Krys was a baby. I grew up in a home that valued thrift, hand crafts and opportunities to be around different kinds people. We went a lot of yard sales. 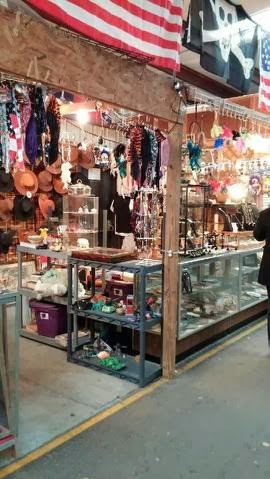 We went to a lot of craft shows too, especially when my brother Ben sold his leather work (which was beautiful, by the way). Mum was (and is) a confirmed garage sale-a-holic. As a whole, we were taught to use it up, wear it out and if we didn't need it, to find a new home rather than throw things out. So, while I may not have gone to flea markets, my upbringing was such that the idea of them inspired curiosity and the intuition that what awaited was a feast for the eyes and my sense of adventure. I've yet to be disappointed. 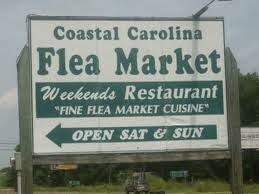 Our local flea market has been around since 1981. It was originally located in an around a long wooden warehouse type structure on the grounds of the Exchange Park Fairground. In 1998, a fire destroyed the entire building. It was a devestating loss for the several vendors who had regular shops in the building. In true Lowcountry style, it didn't slow things down for long. The small town community rallied. The structure was rebuilt even larger with room for hundreds more indoor vendors. 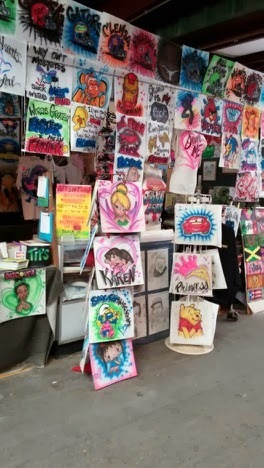 Over the years, the outdoor part of the market has extended far afield from the original area with its cement tables for the temporary or one time vendor. The once empty fields of the exchange park where we'd fly kites, shoot off model rockets or watch the local SCA larp* and practice their weapon skills are now crowded with weekend vendors. I'm sure it's not the largest in the southeast but it's the largest in South Carolina and well worth the visit. 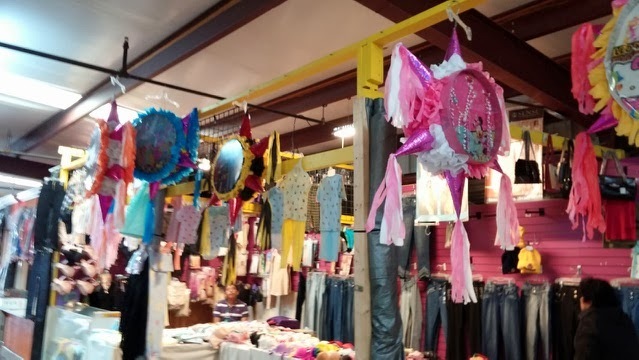 (As The Fabulous can attest) The Coastal Carolina Flea Market continues to grow and thrive with over 1000 vendors over nearly 50 acres of land. It's also 5 minutes straight down the road from our house. I've written about The Peanut Man (who now has his framed photo with our grand daughter, Elena) and our weekly flea market tradition. 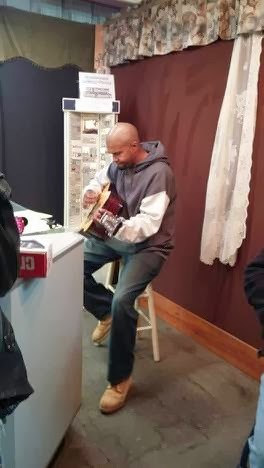 Over the last few months, I've come to know several of the regular vendors, Vined a couple of the local musicians who occasionally play and become a part of this micro-culture within the community. our produce each weekend. After seeing The Peanut Man, of course. from Mexican bottling companies. They simply taste better. Usually the grocer is our last stop. After buying peanuts, we could turn right and straight to the produce... but why would we do that when we can do the whole circuit and see everything? In the summer, this spot under an old oak is prime real estate. The last time I set up a booth at the flea market, it was still small enough to get a concrete table between buildings A and B. (This was during the unmentionable Beanie Baby days... which you can still find there) To this day, even if you're stuck in a shadeless part of the field, it's still the best place to take yard sale items. For $10, you're welcome to set up anywhere outside... as long as you respect the absentee vendors who claim their regular spaces with milk crates, pallets and other items attached to the tables with rope or bungee cords. If you're early and a little lucky, a regular vendor may come by and clean you out of books, clothes and movies. why we always have at least one turtle at home. From vendors selling imported toys and gadgets out of produce boxes to collectable vintage items, antiques and hand crafts, there's always something new to see. For someone like me who loves to watch people but not always engage, this is like a carnival. For the part time treasure hunter, it's Nirvana. On the rare weekends when time and energy aren't a factor, my favorite thing to do is find the spots where things are piled on shelves or in boxes. I'm almost certain to find just the right oddity at just the right price. SCHMOO! Just above him on the right is Snoopy. Hillbilly Jim has antiques, vintage glassware & random STUFF. I'm trading vintage bottles for his collection of blue glass. to talk him out of the Hippies sign. 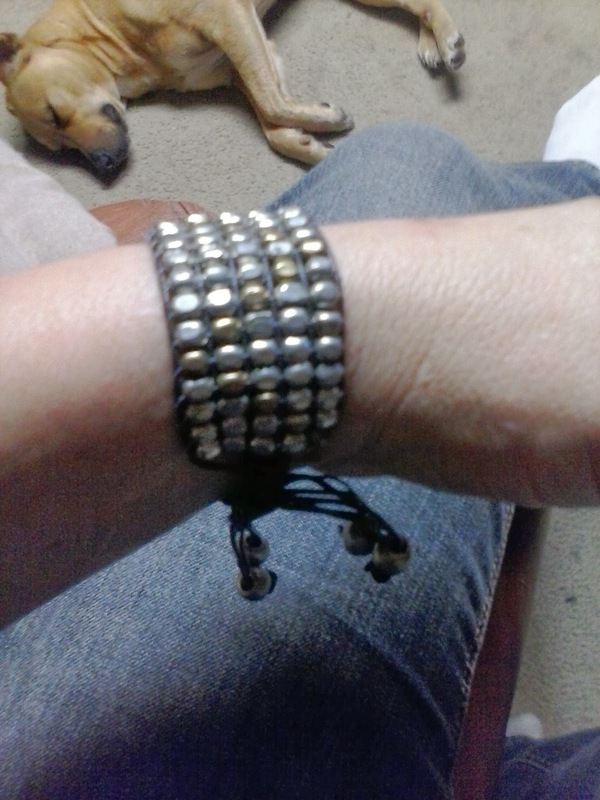 find, I'll repurpose the beads. You can also find locally grown plants, produce, live animals (We occasionally rescue feeder rats from the snake handler... sorry, reptile and arachnid vendor in building E) and bee products, from honey to exquisite candles. One stop shopping. Poultry and rabbits are the extent of available livestock. and dismember me while I slept. cookware collection. He sells things pre-seasoned. Nice. 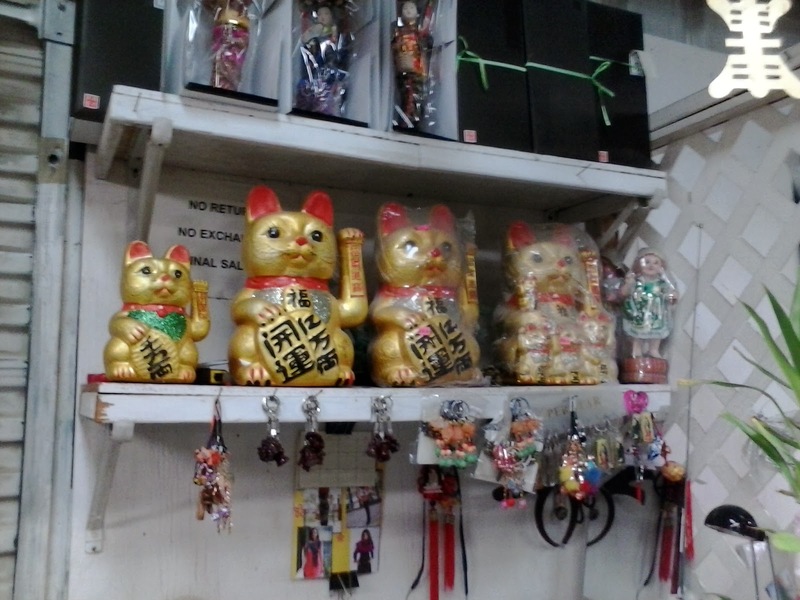 I'm fairly certain Chinese trinkets are a flea market requirement. Also among the regular finds are anything Rasta, Latin American, African, incense, tobacco and pot related. They've got the best head shops in town. 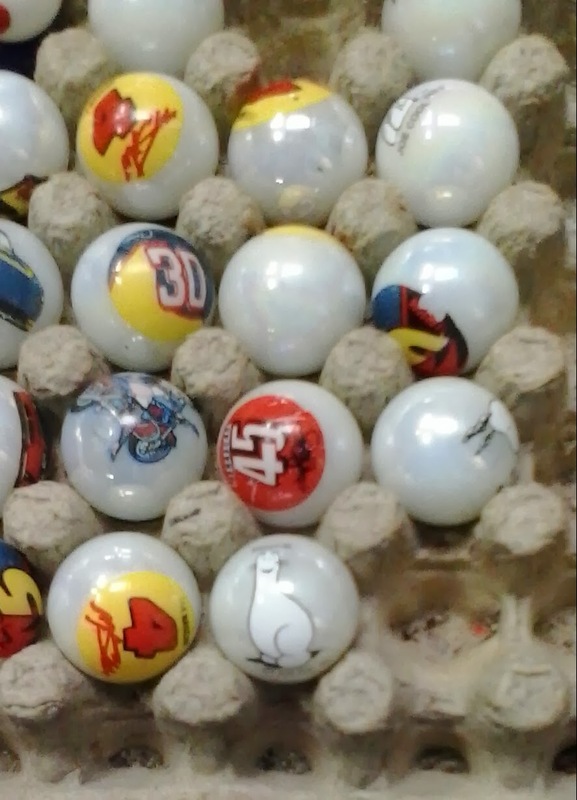 You can also find licensed sports and racing memorabilia and the owner of Castle Keep has a better selection of nearly new to vintage video games at better prices than you can find anywhere. 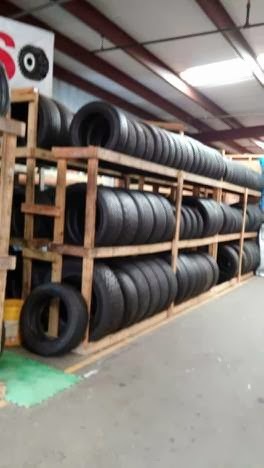 From new mattresses to home appliances to used tires. 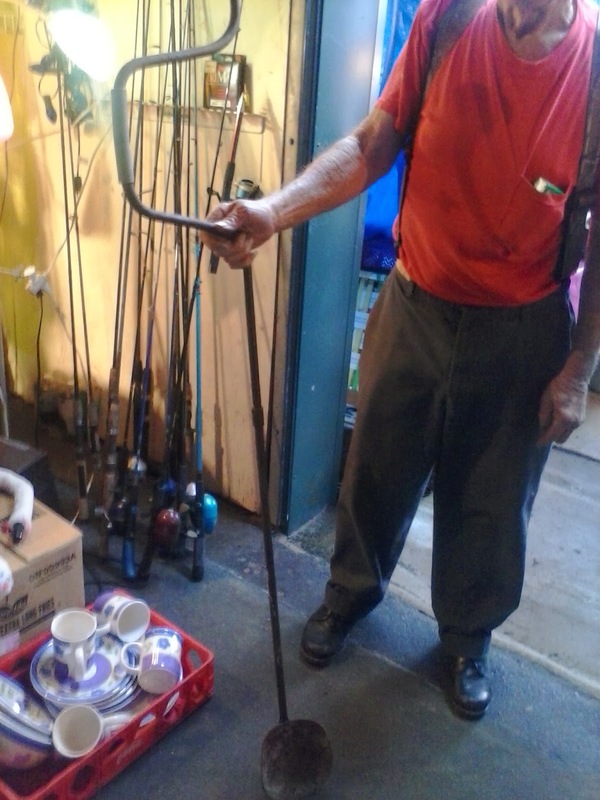 If you need it, you can probably get a good deal at the flea market. 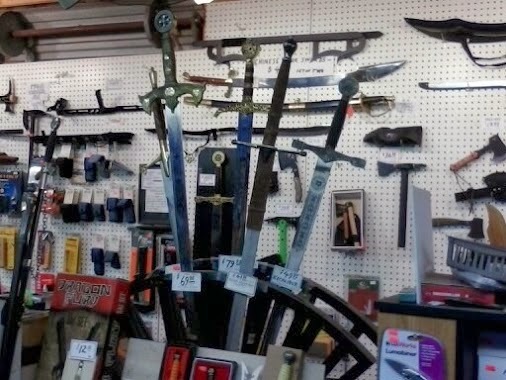 Or, perhaps, a sword? These are replicas. The real knife guy was camera shy. each time I see him. Among my favorite flea market purchases are the the handmade items from local artisans. 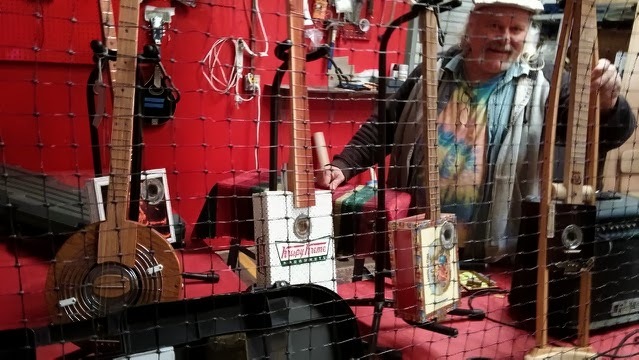 One day, I hope to pick up one of these cool instruments. At least once a month, a Sweetgrass basket weaver will travel from the Mount Pleasant area to offer her distinctly Gullah wares to our area. 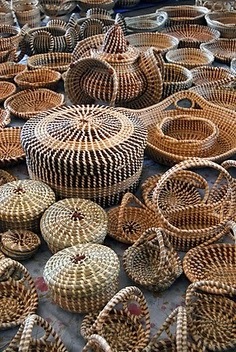 These palm leaf, sweetgrass and long leaf pine baskets date back to slavery in the lowcountry (and African tribes raided for human property) and are a powerful reminder of a dying culture. This is a Sweetgrass display from the Charleston Market. These incredible works of functional art can run in the thousands of dollars. a member of the local Edisto tribe. We have a small but very proud Native American tribe in the area and they too are represented in our melting pot of local commerce. Flea markets and swap meets have gotten a bad rap over the years. There tends to be an assumption it's the lowest common denominator of the retail/re-sale world... a place of illegal or unsavory people and behavior... but I've found it's mostly made up of hard-working people just trying to make a living. Like any group of people, you'll find a few jerks but honor is a big deal with this giant family-like community. People watch their neighbor's wares, gossip around stall corners and make as much fun as is possible when temps are below freezing or over 95. They take care of each other, raise funds to help vendor families in need and get to know the regulars beyond passing familiarity. When I'm in a place where I have an inventory of my own handcrafts to be worth setting up, I'll be out at the flea market before I open an etsy shop. It's simply more fun. I could go on but really, it's the kind of thing you have to see for yourself. If you ever find yourself in the Charleston area, shoot me an email. I'd be happy to give you the tour... and introduce you to The Peanut Man. * Larp, or LARP stands for Live Action Role Play. Kind of like war re-enactors only with a little more creative and historical flair. Also, Dear Spellcheck: Larp is no longer an acronym... it's a full-fledged word.